Photo collages are great — in theory. You gather your best photos centered around a theme, and assemble them together to tell a visual story in an attractive way. But, if you’re like most of us, the time and technical expertise required to create a photo collage worthy of displaying is so daunting that those great ideas for collages fizzle pretty much as fast as they surface. To the rescue comes Artistic Photo Canvas. Meet your new favorite “thingamajig” on the web — where mere mortals can create awesome looking collage canvas prints in, well, mere minutes. APC’s new photo collage creator is robust and versatile enough to rock any theme. Yet it’s super easy to learn and fun to play with, meaning you can become a collage canvas ninja in no time! Upload a few images and pick a template to get started. Keep your design simple if you’d like — or jazz it up with your own special mix of backgrounds, text, borders, shadows and glow effects. Don’t like uniformity? Go ahead and “mess up” your new photo arrangement with the touch of a button. If you have been trying to sell more printed photographs to clients but have been unsuccessful, consider adopting a new approach — one that takes guesswork out of the equation and allows your customers to easily visualize the beauty of your work — hanging in their home. 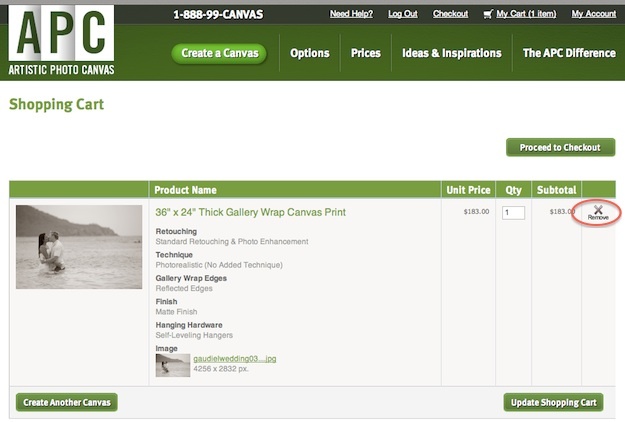 Whether you are trying to sell canvas gallery wraps or framed photographs, the strategies in this article work the same. In the past, you’ve most likely relied on your clients’ abilities to “imagine” your photographs hanging on their walls. The problem with this approach is that many people do not possess an imagination vivid enough — or a sense of space and proportion reliable enough — to do that “imagining” effectively or confidently. The resulting lack of “vision” naturally leads to indecision and little or no motivation to buy. To sell more prints, you’ll need to go above and beyond the call of duty. You’ll need to “fill in the blanks” for them. By employing the following approach, you’ll awaken your clients’ vision, enabling them to confidently commit to their print purchases. Option A: Photograph a living room or other interior scene that is clean and elegant and features an empty wall prominently. 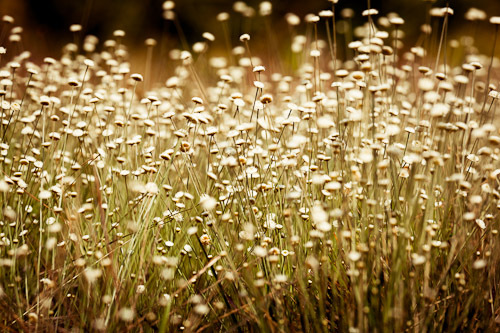 Option B: Purchase a photograph of a similar scene at a stock photography site such as iStockPhoto. Here’s one by Shenki. 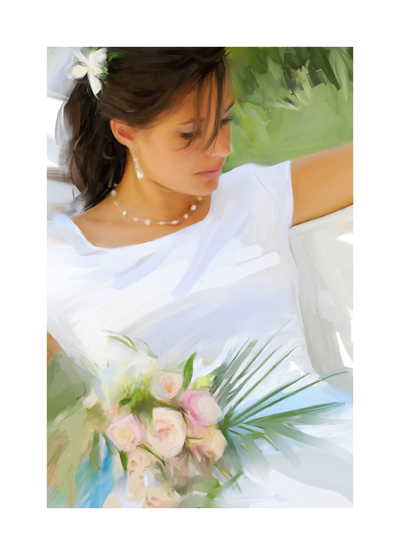 Template A: First, I recommend a template for showing canvas prints. This one is very simple because, viewed head-on, it’s not necessary to create the wrapped edges. The easiest way to simulate the floating gallery wrap effect that is so magical is to add a very subtle drop shadow. Template B: The second template is trickier. To simulate a framed print, you want to create an empty picture frame that is elegant. You could return to your stock photo site and purchase a picture frame template, or find a Photoshop tutorial on how to create your own. Somewhere in the template, you can optionally add a price, or text that includes language such as “Want this photograph on your wall?” Even without text, having your client’s photograph hanging on a wall will subliminally make an impact. Remember, once you have your templates created, you never have to recreate them. 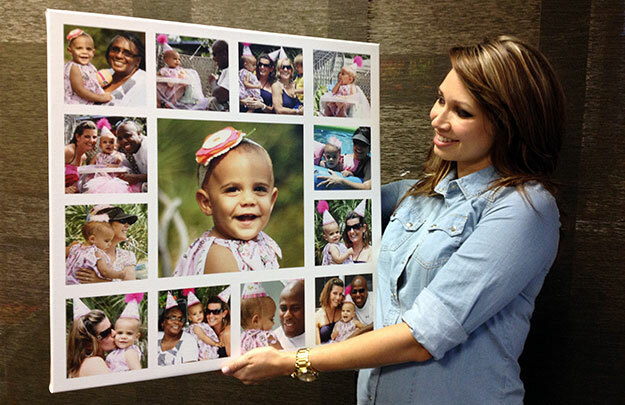 Take your favorite photograph from your client’s session and place it inside of your new template, whether a framed or canvas print. Save the image with the photograph hanging above a couch, for example, and keep it with the session’s photographs that you plan to upload for proofing. 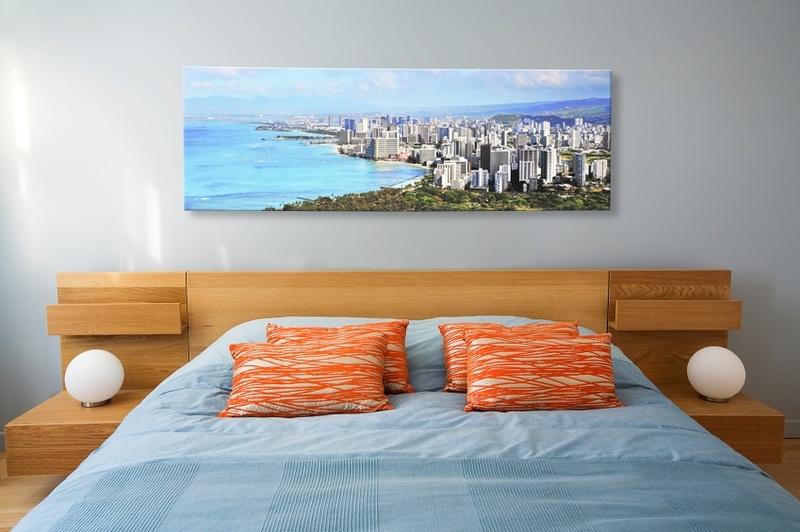 Want a reprint of a gallery wrapped, framed or unstretched canvas print you've previously ordered from Artistic Photo Canvas — but don't want to start a new order from scratch? No problem! You can get APC reprints while bypassing the entire canvas configuration process. It's fast and easy to do! 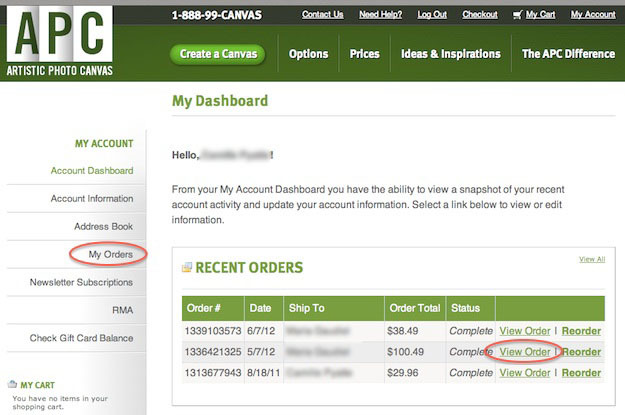 Here's how: Log in to your APC account by clicking the "My Account" link at the top of any page at artisticphotocanvas.com. Voila! 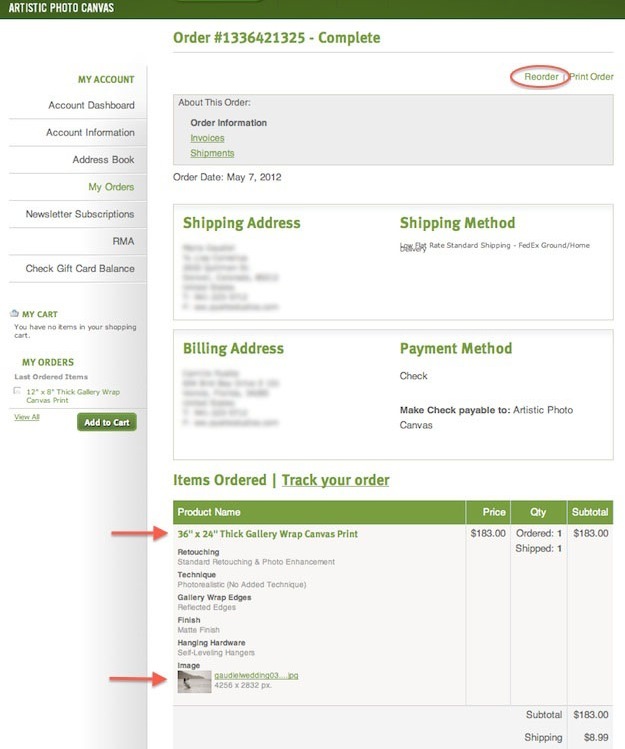 Having confirmed your reprint details, you're now ready to proceed through the checkout process. Ready to try it? Get started. Prize Alert! …Read on to see how you could win one of five signed copies of Doug Sahlin's latest book, Digital SLR Settings & Shortcuts for Dummies. 1. Pick the low hanging fruit first: When you see a scene or object worth photographing, take the first picture that comes to your mind. Then slow down and analyze what you’ve got. Move around until you see the composition that best captures your vision and take another picture. Repeat as needed. 2. Simplify: Some photographers try to include too much information in a photograph. When you compose a photograph, see what’s in the viewfinder. If what you see is confusing, zoom in to remove some of the elements. Cut to the chase and simplify the image. Less is more. 3. Wait for the light: Sometimes you’re in the right place at the wrong time. If the light is harsh (also known as “Sucky Light”), wait a few minutes for clouds to diffuse the sunlight, or come back when the light is better. 4. Do something different: Einstein’s definition of insanity is doing the same thing over and over again and expecting different results. When you see an object or scene that you want to photograph, don’t photograph it in the same way you usually do. If you normally use a wide-angle lens, switch to a telephoto lens or switch to a different vantage point. Break out of your rut and stretch the envelope. 5. Photograph a shape: Many photographers photograph objects like trees, buildings or cars. Instead of photographing a tree, look for an interesting shape that just happens to be a tree. You don’t have to photograph the entire object. Sometimes you find an interesting shape within an object. You can find interesting shapes everywhere. Hey everyone! Hope you all got home safely from Photoshop World. It was a hectic week but I know we all had a blast. For those of you that stayed home, thanks once again for tuning into our coverage here on the The Photo Canvas Blog. We really appreciate it and hope it's been helpful! 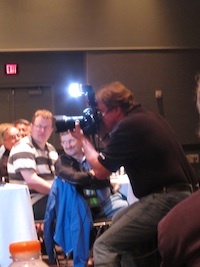 After my sessions with Joe Mcnally Thursday morning I headed to hear a series of talks on social media and blogging. The first was a session called "Tweeting With Authority" by Rod Harlan, wherein he discussed various aspects of how Twitter functions – as well as third party resources. The first key discussion point was understanding that Twitter is all about dialogue. It's not a one-way street; the beauty of the network comes from the interaction between vast ranges of individuals. You have to engage with your audience, and the more you do so the more connected you and your audience will feel. If you work to create a truly personal and beneficial relationship between you and your followers, then you will see the benefits that Twitter has to offer at their greatest potential. One of Rod's personal tips was to only use 115-120 of the 140 available characters on Twitter to allow space for people to retweet your post or add their own small thought. He also suggested that if you're lacking substantive or interesting material to tweet about, search through sites like Delicious or StuffToTweet to find neat links to share with your followers. Rod also mentioned several useful third party applications like CoTweet, which allows you to give several people access to the account, SocialOomph that will allow you to schedule tweets, and Untweeps which helps you manage who is following you so you can block spam. 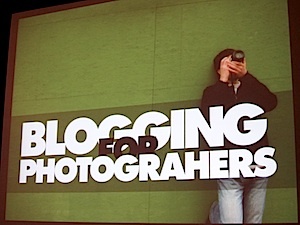 Directly following this session was a panel discussion hosted by Scott Kelby, Matt Kloskowski, and Richard Harrington entitled "Blogging for Photographers." Here Scott and the gang provided some very useful, concise pointers on blogging that I'd like to share. Firstly, its important to understand the power you stand to gain from blogging. Traditionally, sharing information with wide audiences was restricted to a small group of privileged individuals who had access to large publishing companies. However, with a blog, you now become your own publisher! You are free to share what you want, when you want, with whoever you want for virtually no cost. This is a tremendous opportunity for yourself or your business that the world has literally never experienced before. Take advantage of it! Once you get your blog up and running there are a couple important things to keep in mind. First is consistency. Make a plan. Decide on a reasonable schedule for how many times a week (three is a good starting place) you can absolutely commit yourself to posting, and stick to it. Readers like to have consistency because it gives them something to anticipate, and hence a reason to keep coming back to your site. Also make sure to try and add a photo to every post you make to keep things interesting. Even if you don't have photos laying around to post, you can easily find royalty/license free images online, or even spend a couple bucks to grab some from iStockPhoto. 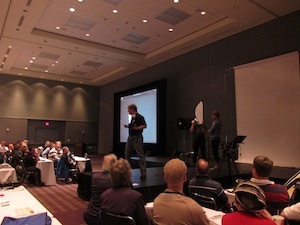 Joe McNally is the master of all things flash, so there was no way I could miss his speed light session at Photoshop World on Thursday morning. Joe's first class focused on getting the most out of one light, and the results are truly amazing. Often people think that to produce beautifully lit photos you need some seriously expensive studio equipment. But that's no longer the case; a small investment into a single speed light and some very cheap, or even DIY light modifiers, can go a long way. The first thing Joe pointed out were the three essentials of light: quality, color, and direction. In terms of quality, are we going to use a large, soft light source like an octabank, or will we only fire the bare bulb for harsh lighting effects? More importantly, what effect will that decision have on the mood or feeling of the photo? Next is color. Are you looking for daylight balanced flash for a natural look, or will you add a gel to give a colorful flare to your photos? Color is critical, and understanding color symbolism, or the mood that certain colors elicit, is even more beneficial. And lastly, direction. Where will you place your light source and how will this affect your exposure, story, feeling, even composition? Joe of course also offered a couple of technical tips to boot. First, the closer the light source is to your subject, the bigger it is relative to the subject, and the softer the light will be. It's also important to understand the difference between exposure compensation and flash compensation. Changing your camera's exposure comp is a "global change" and will affect all aspects of the photo including the ambient light and the effect the flash has on your overall exposure. Changing your flash compensation however, only alters the amount of light that comes from the flash and not the overall exposure of the picture. 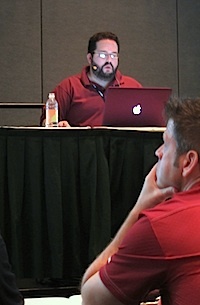 I attended Scott Kelby's session on Portrait Retouching at Photoshop World. As you could probably guess, it was awesome. Scott is one of the best teachers around. He's got such a relaxed and humorous yet informative teaching style. Scott puts a lot of emphasis on a model's eyes, and showed an easy way to remove red blood vessels in the eyes in Photoshop. First, choose a small soft brush, set it to 20% opacity, then sample the color directly next to the vein and just paint over it. That simple. Just always make sure you resample next to the vein you want to remove for the most accurate and realistic retouch. And if you think that the resulting texture is a little too unrealistic in the eye, just go to the filter menu, choose add noise, and brush in a little monochromatic noise into the retouched area of the eye for added realism. Another great tip for enhancing the eyes is to add an extra catchlight that looks like a soft reflection. Take your Elliptical tool and draw a small oval. Then cut out of chunk of the oval so you end up with a "crescent moon" shaped selection. Fill the selection with white, add a small blur to it in the filter menu, and set the blending mode to soft light. Position the shape appropriately in the eye, and now you have a nice kicker light effect to add a little pop to the photo. The first class I attended at Photoshop World was hosted by RC Concepcion and discussed how photographers can easily get their photos on the web without having to know any technical code. RC focused on some basic tips and ideas of website development as well as free resources on the web. For instance, you can create a full slideshow of your images for free by uploading photos to a set on Flickr, then clicking the "share" button in that set and copy and pasting the HTML code provided for you. You can then embed this full-fledged slideshow anywhere on the web for free, and only with the click of your mouse. No coding necessary! You can also easily leverage Flickr to generate traffic to your website/blog by tagging your photos with relevant tags (city, state, subject, camera, etc.) and including a link to your site in the caption. How easy is that! ?